The Technology for using SG Iron Convertor process is adapted from M/s George Fischer, Switcherland. 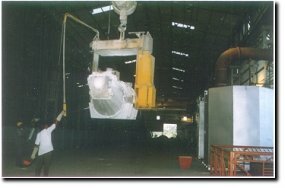 This process provides a host of advantages when compared to conventional processes. The Dross formation is considerably less. The recovery of Magnesium is highly consistent. The treatment costs are comparatively low. Exceptionally high rate of consistency in quality and Low sensitivity to human errors. The George Fischer Converter Process allows Pure Magnesium treatment in the Converter Vessel. The 1.7 - 2.27 Tonnes Bail Converter can comfortably handle 6 - 8 Tonnes of liquid metal per hour.